Hot Music Videos is a free Windows 8 Music Videos app that lets you watch the hottest music videos from all over the world, sung by popular artists of all time. You can sort videos by artist, genre, county, or year, or simply watch videos from Top Artists, Featured Playlist, Female Artists, Male Artists, or Most Famous categories. 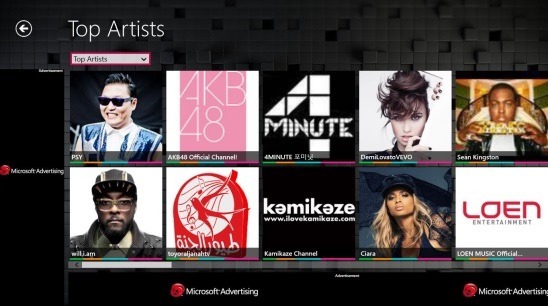 Browse for songs within this free music videos app for Windows 8 and watch all the latest happening videos. The app gives you the option to choose from three available video resolutions, which are Small, Medium , and High Definition. This can be of great help if your internet is working slow. Plus you can also rewind, fast forward, instant replay the video, or watch it in slow motion. Plus, you can also snap the app to either side of screen and carry on with whatever you were doing, while watching your favorite videos side by side. You can get this free Music Videos App in Music & Videos Category in Windows Store. The app looks fine and it has a good set of eye catching colors. The moment you launch it, you’ll be with the Main Screen of the app. This screen contains the “Artist of the Month”, clicking on which takes you to the artist’s screen, and from there you can watch almost all the videos of that artist. Besides that you’ll find the Recently added, Top Artists, Featured Playlist, Female Artists, Male Artists, Genre, Countries, Years, and Most Famous categories on the Main Screen. All of these categories have number of videos songs inside them. You can easily browse through them, and find the track that you were looking for. The fact that everything that you’ll need to watch any video, is present on the Main Screen itself, makes the app very useful and fast. Simply click on the category, and you’ll get all of its videos and artists right in front of you. Finally, click on the desired track, and that video will get played. Like said before, you can watch the videos in three video resolutions, plus you can pause, play, change volume, and toggle between normal view and full screen views. Besides this, you’ll also get the above mentioned video playback control buttons (rewind, fast-forward, instant replay, etc.). An interesting thing about this app is that when you play a video, you’ll get all the videos of that category at the bottom and the videos that you may like at the right side; this makes finding other songs easy. The navigation becomes much faster because you can jump to any category or to the home screen directly from no matter which screen you are in, by just Right clicking on that screen. You can also use the Search Charm (Win + Q combo) to search for a particular artist or song. Another good feature of the app is, it let users watch the videos from their own country. It includes a number of countries in its list, and you can also get lots of old videos, counting from 1960s. Good Windows 8 music videos app. Good amount of music collection. Different genres like Pop, R&B, Hip-hop, Rock, Indi Pop, Kpop, Jazz, Reggae,Blues, and many more. Music videos from 1960s to present. Music videos from different countries. Good video playback control buttons. Option to snap and search using Windows Search Charm. Hot Music Videos is really a good Windows 8 Music videos app. This app does a good job by keeping everything on the main screen and keeping navigation simple and easy. Plus the various characters (called monsters) in the app, which pops up with a funny dialog while you are waiting for the app to play a music video or during any kind of error, are witty. This feature plus the other features mentioned in the article makes this music videos app a well-done, and keeps you entertained. Definitely worth a try! Get Hot Music Videos here.